An unpredictable Ramkumar Ramanathan will open India's campaign against fifth seed Serbia with a match against Laslo Djere even as coach Zeeshan Ali downplayed Yuki Bhambri's absence from the side in the World Group Play-off tie, starting Friday. Djere is ranked higher than Ramkumar at number 86 but is yet to win a match in Davis Cup. On the other side, Ramkumar is placed 135 in the world but is far more experienced, having played six ties with a 7-5 Win-Loss record. Left-handed Prajnesh Gunneswaran, being the number two singles players from India, will take on Serbia number one Dusan Lajovic, the highest ranked singles player of the tie at number 56. On Saturday, Rohan Bopanna and N Sriram Balaji will take on the home pair of Nikola Milojevic and debutant Danilo Petrovic in the doubles rubber. The reverse singles will be played on Sunday with Ramkumar taking on Lajovic and Prajnesh, ranked 162, locking horns with Djere. 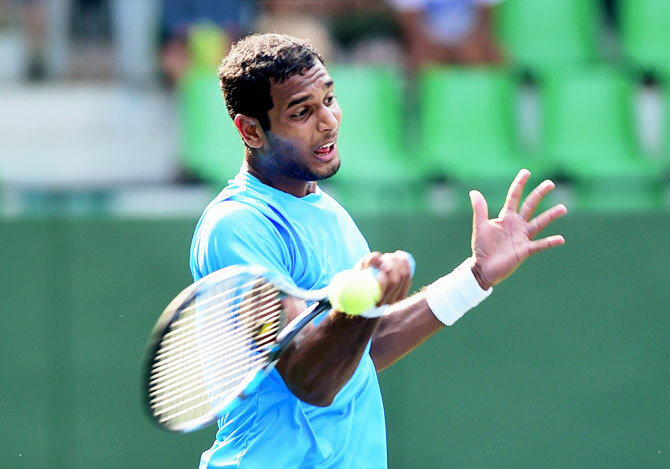 Ramkumar has played against Lajovic in 2017 and had beaten him but the Serbian is in the form of his life as he recently beat US Open finalist Juan Martin Del Potro. India are without top singles player Yuki, who is nursing an injured knee, but coach Zeeshan Ali says it should not be an issue. "Not having Yuki while playing on clay court is not a big setback for us. Looking at the last nine months, Yuki has played one odd or two matches on clay. His ranking is higher than the other two players but his game is not suited for clay. It would have been great to have him on the team but it still is not a great setback considering the surface," Zeeshan told PTI. "The good things is, that people like Ramkumar, Prajnesh and Balaji, they have been training in Europe on clay for the last few years. It's not a new surface for these players. They are used to playing on clay. Ten years back, we did not have players, who could play on clay but now it is different," Zeeshan added. Saketh Myneni is the fifth playing member of the squad and talented Arjun Kadhe is there as a reserve player.